AR&Co. 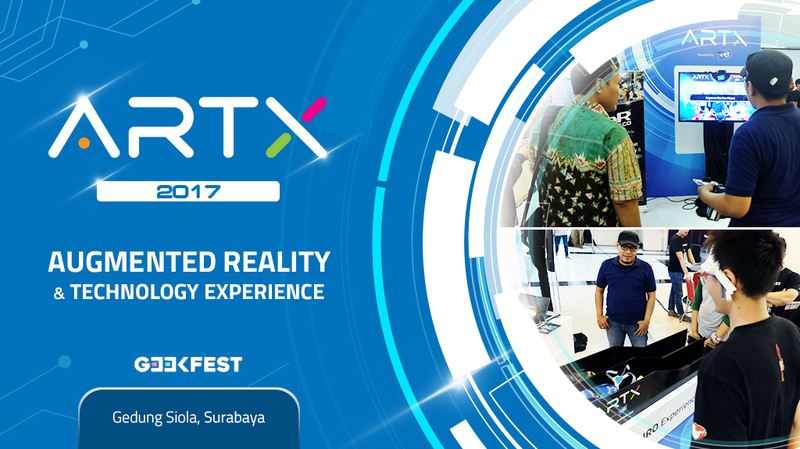 is back with its Augmented Reality Technology Xperience (ARTX) event this year, which is held in conjunction with GEEKFEST. ARTX 2017 was held in Gedung Siola, Surabaya on 20th-21st May 2017 and was attended by approximately more than 8,000 visitors each day. At ARTX 2017, visitors were able to play and experience Augmented Reality games in the provided booths, the games include: AR Gun Game and AR Interactive Game. Besides of those booths, visitors were also invited to test their level of focus to operate remote controlled cars using Neuroscience technology. On the other side of the booth, visitors could also create their own 3D figures. Peter Shearer, the Managing Director of AR&Co. also had a chance to share with the visitors by giving a seminar about “How AR Shapes Creative Industry in The Future”. In addition, as a form of appreciation and gratitude to the city of Surabaya for the opportunity to make this event happen, AR&Co. in collaboration with Kratoon and My 3D created a 3D figure mannequin of Surabaya’s Mayor – Mrs. Tri Rismaharini, which was then handed by AR&Co. CEO – Mr. Daniel Surya and Mr. Yansen Kamto as Chief Executive of KIBAR.